Stuff Points: Earn 26 points when you buy this stuff. A metal core is completely surrounded by thick, natural rubber to create a unique and powerful outdoor tool. It's similar in design to a bow rake, but it also combines aspects leaf and landscape models to ensure an incredibly versatile tool. The 16 inch wide head has 27 tines that are tapered in shape, and slightly flexible when pressure is applied. When compared to traditional tools the tines will be closer together, and unlike others, they also curve inward at the tip to improve control. The rubber ends won't skewer leaves like metal versions do, and when they come in contact with flowers and delicate plants, they won't cause damage because they flex slightly instead of breaking or pulling the stuff they contact. Use it to collect grass clippings after mowing, clear leaves from your yard in the fall, spread mulch around shrubs, smooth gravel for a patio, level soil prior to planting, and more. When oriented normally it will dig down slightly to loosen dirt or gather loose debris, and if you flip the rake over, you can spread stuff evenly, or level the ground. Although the tines give slightly to remain gentle on your plants, they are adequately strong and rigid to accomplish any job, and they always return to their original position. You'll never have to worry about broken plastic or bent metal, and the natural rubber head has a wide, low profile design so it's easy to work in tight spaces. With nearly indestructible materials used to make the head, and a commercial grade handle, this tool is guaranteed to perform well, and last for years, even with regular use. High Quality - Made from top quality materials, this tool offers commercial quality strength and durability. You can be sure that it will perform well and last a long time without failing. 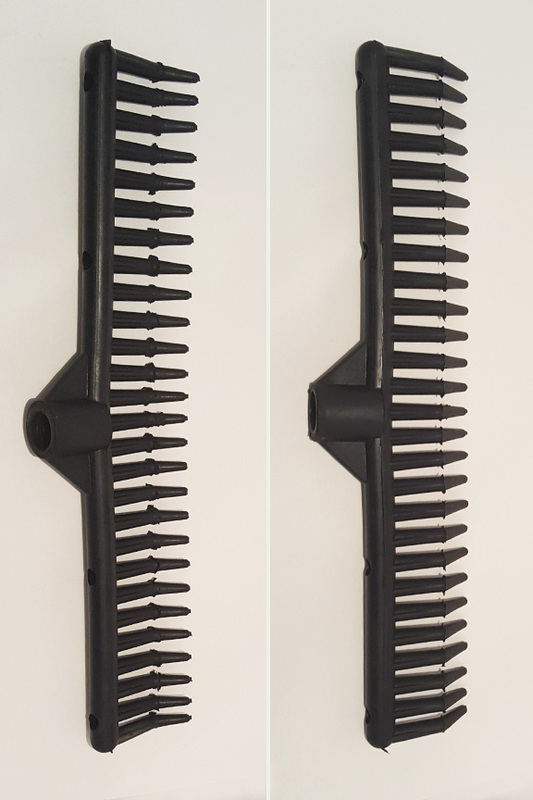 Natural Rubber - The rake head is made from a solid piece of molded rubber, and the result is a landscaping tool that is both gentle and effective. Because the natural material is similar to the rubber used to make car tires, you know it will maintain a high level of performance, even with regular use. Versatile - Not just for leaves, the design of this tool makes it useful for all sorts of jobs in your garden. With a slight bend in the tines and a tapered shape to each one, you'll find it easy to smooth soil, spread mulch, collect clippings and more. 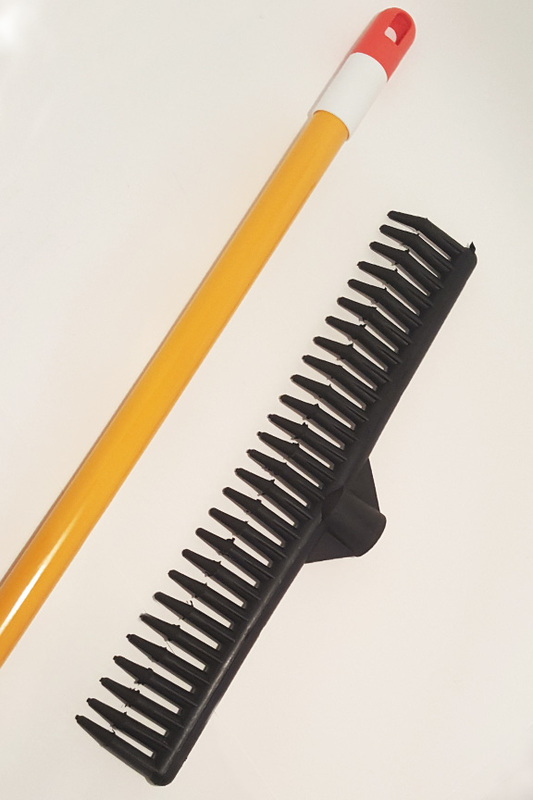 Durable - A steel handle complements the rubber head, and they combine to create a strong tool that is ideal for homeowners and professionals alike. Easy Storage - The end cap for the pole features a large hole that swivels, so you can easily hang the rake on a hook or holder when it's not in use. Long Handle - Many similar tools are equipped with shorter poles that make certain jobs more difficult, and use by taller people impossible. This one comes with a sixty inch pole, so even when attached to the head, you'll have a full fifty nine inches of length. Head Size 16" x 4"
Uses Spread mulch, loosen soil, collect grass and leaves, etc..
A versatile outdoor tool that will provide long lasting performance. It's gentle on plants and flowers, but efficient at getting the work done. Order Yours Today! It's good and does what it's supposed to do, but not as good as one I got 30 years ago, which I am still using. 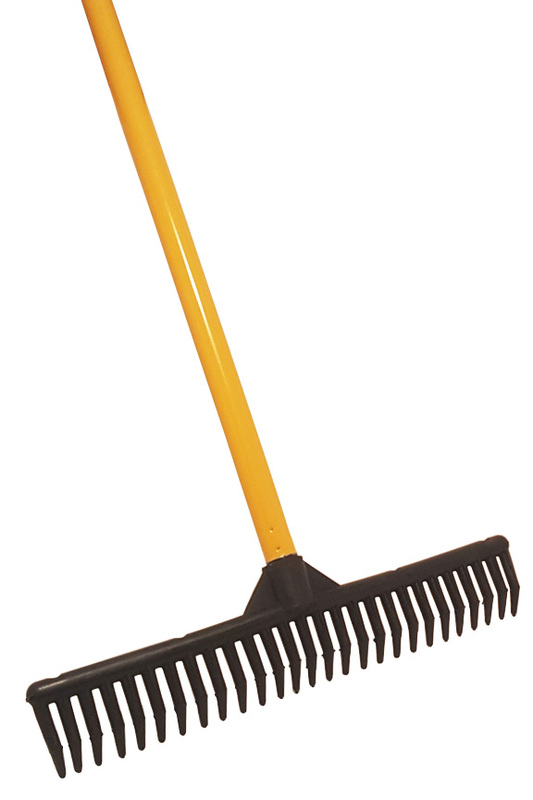 I'm glad I was able to find your rake so I'll have one ready for replacement when the time comes.